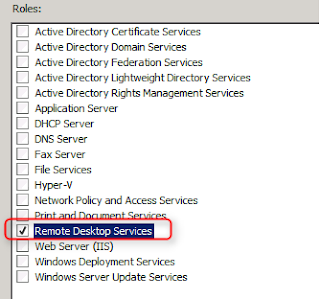 To deploy Remote Desktop Gateway in Windows Server 2012 or Windows Server 2012 R2, please read the following post. 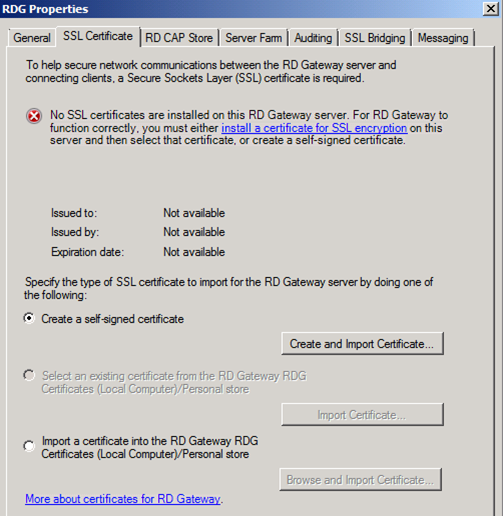 I will install remote desktop gateway on Windows Server 2008 R2. Assuming I registered a domain name, contoso.com, on Internet. 1. At a server, log in as Administrator. 2. Click "Start", enter "sysdm.cpl". 3. Select "Computer Name" tab, click "Change". 4. Under "Computer name", type "rdg". 6. Under "Primary DNS suffix of this computer", type "contoso.com". 7. Click "OK" three times. 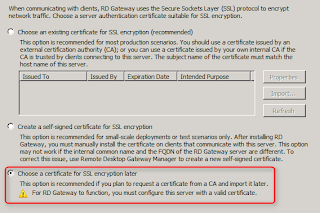 You have to provide the FQDN for generating the certificate. 1. At "rdg.contoso.com", log in as Administrator. 4. At "Before You Begin", click "Next". 5. 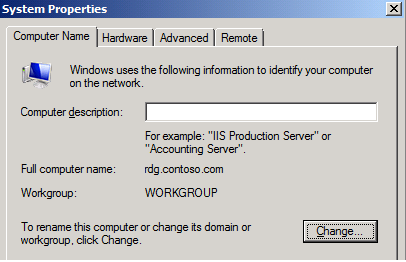 Check "Remote Desktop Services". 7. Check "Remote Desktop Gateway", click "Add Required Role Services". 9. 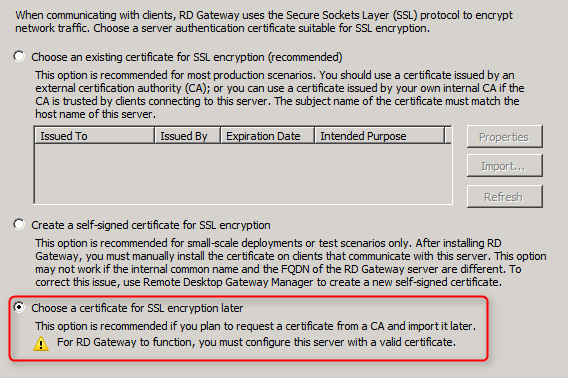 Select "Choose a certificate for SSL encryption later". 11. At "Authorization Policies", select "New". 13. At "RD Gateway User Groups", you can add users or groups to use this Remote Desktop Gateway. 14. I would like to let Administrators group use this Remote Desktop Gateway, click "Next". 15. 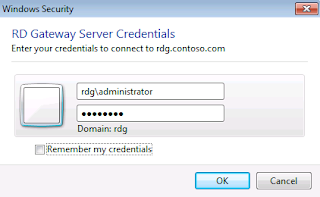 At "RD CAP", you can change the name select the authentication method for Remote Desktop Gateway. 17. 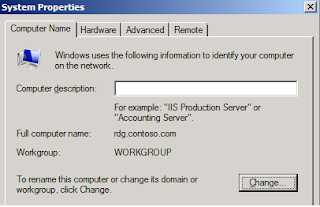 At "RD RAP", you can control which computers can be remote control through this Remote Desktop Gateway. 18. Select "Allow users to connect to any computer on the network". 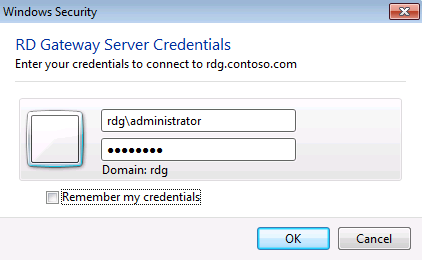 Remark: You can change the settings of "RD CAP" and "RD RAP" after installing Remote Desktop Gateway. 20. Still check "Network Policy Server", click "Next" twice. 21. 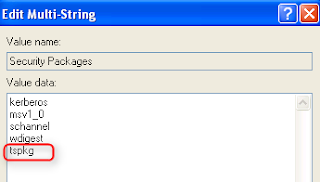 Leave the default IIS settings, click "Next". 23. When installation finished, click "Close". 2. Launch "Remote Desktop Gateway Manager". 3. Right-click "RDG", select "Properties". 4. Select "SSL Certificate" tab. 6. Next to "Certificate name", make sure the name is same as your Internet domain name. 7. Check "Store the root certificate". Remark: You can use the third-party certificate which is signed by Trust Root CA. 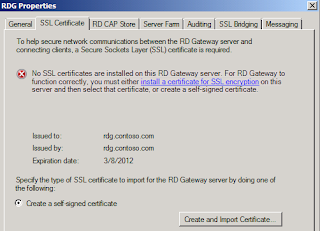 Remark: Remote Desktop Gateway supports wildcard certificate. The certificate was installed in the server. 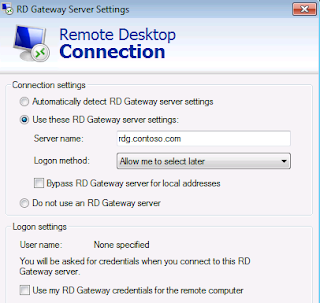 To connect Remote Desktop Gateway, the Remote Desktop Gateway version must be 6.0 or later. 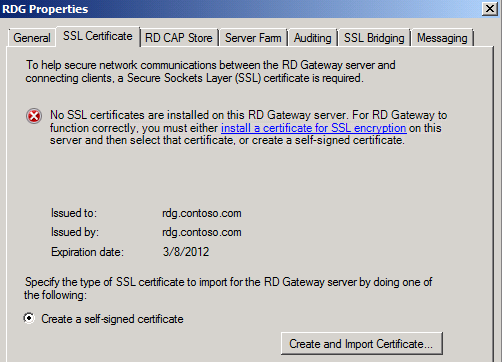 You have to install the certificate which was generated by "rdg.contoso.com". 1. 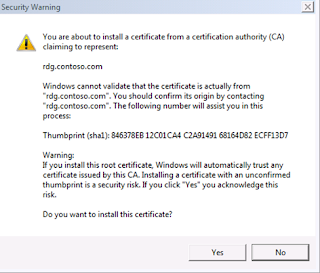 Copy the RDG certificate to a workstation you want to use. 2. 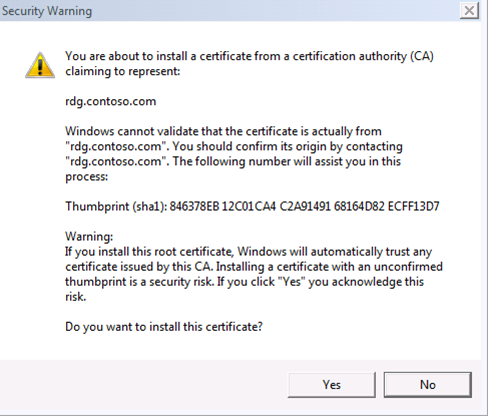 Right-click the certificate,"RDG", click "Install Certificate". 4. Select "Place all certificate in the following store", click "Browse". 5. Select "Trusted Root Certification Authorities", click "OK". 8. Click "Yes" to accept install the certificate. 1. At a workstation, launch "Remote Desktop Connection". 2. At "Remote Desktop Connection", click "Options". 5. 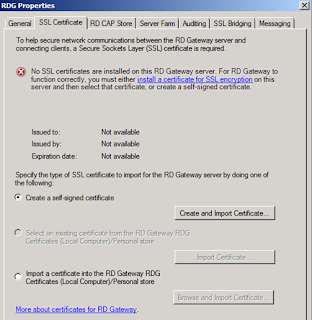 Select "Use these RD Gateway server settings". 6. Next to "Server name", type "rdg.contoso.com". 7. Next to "Logon settongs", un-check "Use my RD Gateway credentials for the remote computer". 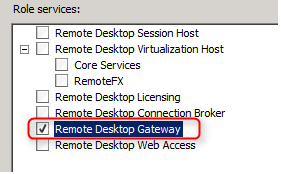 Now, you can remote the other computers through the Remote Desktop Gateway. 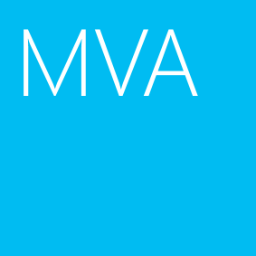 Remark: A computer installed Windows Vista or later need to be entered "Computer Name\User Name" for RD Gateway Server Credentials. Remark: For Windows XP, you have to modify the registry to support Network Level Authentication. 3. 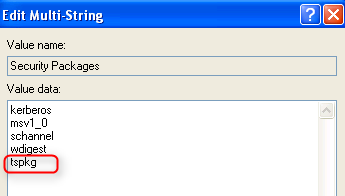 In the detail pane, double-click "Security Packages". 4. Add "tspkg" in the bottom. 7. In the detail pane, double-click "SecurityProviders". 8. Type "credssp.dll" at the end of value.